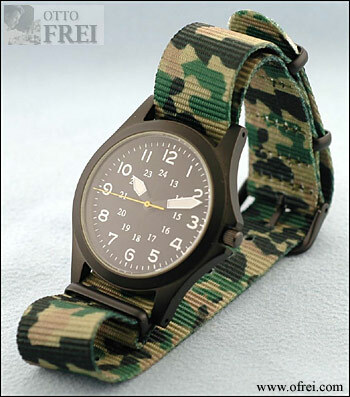 NATO style green camouflage nylon watch strap with Black metal keepers and buckle. The lug to lug "space for case" distance is 2 9/16 inches (65 mm). Total length measures 10 3/4 inches, Fits wrist sizes from 6 1/2 to 9 1/2 inches. Thickness measures 1.05 mm. Fits lug size 18 mm. 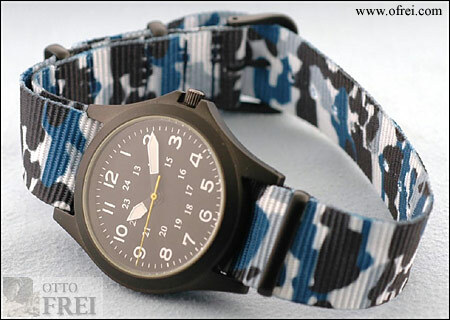 NATO style green camouflage nylon watch strap with sandblasted finish metal keepers and buckle. The lug to lug "space for case" distance is 2 9/16 inches (65 mm). Total length measures 10 3/4 inches, Fits wrist sizes from 6 1/2 to 9 1/2 inches. Thickness measures 1.05 mm. Fits lug size 20 mm. 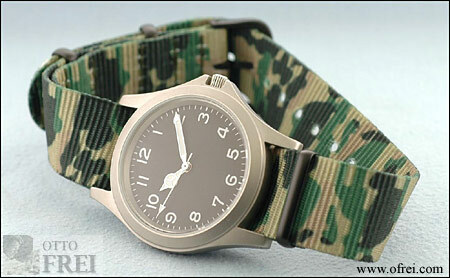 NATO style green camouflage nylon watch strap with sandblasted finish metal keepers and buckle. The lug to lug "space for case" distance is 2 9/16 inches (65 mm). Total length measures 10 3/4 inches, Fits wrist sizes from 6 1/2 to 9 1/2 inches. Thickness measures 1.05 mm. Fits lug size 22 mm. 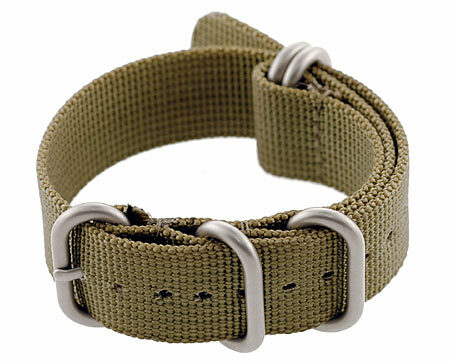 NATO-style nylon strap with 4 satin finish metal keepers and buckle. The lug to lug "space for case" distance is 2 9/16 inches (65 mm). Total length measures 11 1/2 inches. Thickness measures 1.70 mm. Fits lug size 20 mm. 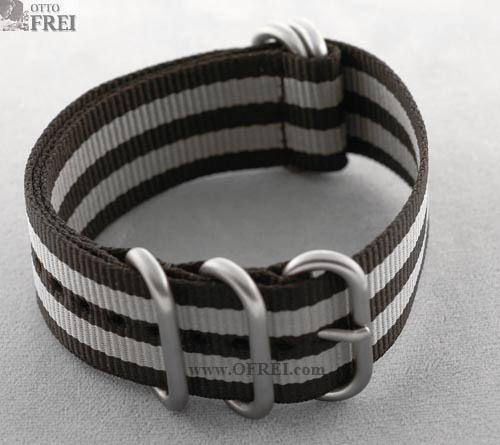 NATO-style nylon strap with 4 satin finish metal keepers and buckle. The lug to lug "space for case" distance is 2 1/2 inches (64 mm). Total length measures 12 1/2 inches. Thickness measures 1.70 mm. Fits lug size 22 mm. 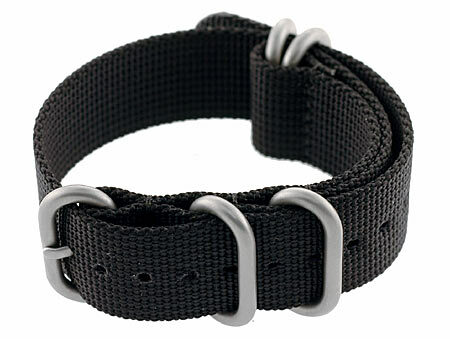 NATO-style nylon strap with 4 satin finish metal keepers and buckle. The lug to lug "space for case" distance is 2 1/2 inches (64 mm). Total length measures 11 1/2 inches. Thickness measures 1.70 mm. Fits lug size 22 mm. 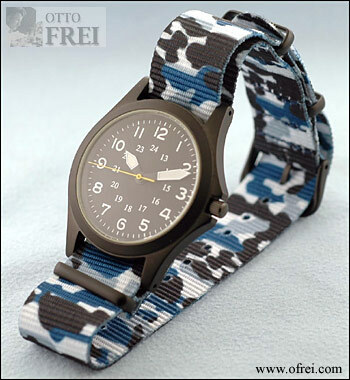 NATO-style nylon strap with 4 satin finish metal keepers and buckle. The lug to lug "space for case" distance is 3 inches (76 mm). Total length measures 12 1/2 inches. Thickness measures 1.10 mm. Fits lug size 20 mm. 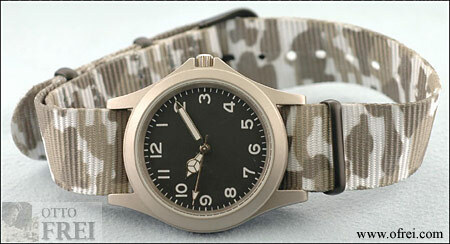 NATO-style nylon strap with 4 satin finish metal keepers and buckle. The lug to lug "space for case" distance is 3 inches (76 mm). Total length measures 12 1/2 inches. Thickness measures 1.70 mm. Fits lug size 22 mm. NATO-style nylon strap with 3 shiny finish metal keepers and buckle. The lug to lug "space for case" distance is 2 9/16 inches (65 mm). Total length measures 10 3/8 inches. Thickness measures 1.00 mm. Fits lug size 18 mm. 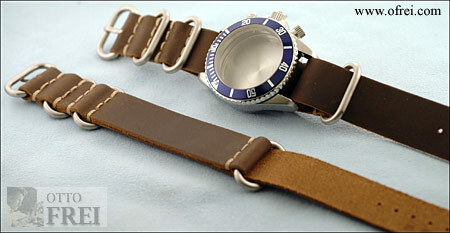 NATO-style nylon strap with 3 shiny finish metal keepers and buckle. The lug to lug "space for case" distance is 2 9/16 inches (65 mm). Total length measures 10 3/8 inches. Thickness measures 1.00 mm. Fits lug size 20 mm. 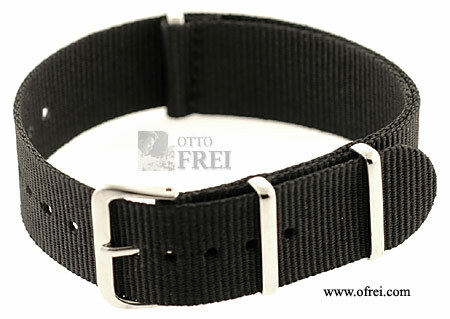 NATO-style nylon strap with 3 shiny finish metal keepers and buckle. The lug to lug "space for case" distance is 2 9/16 inches (65 mm). Total length measures 10 3/8 inches. Thickness measures 1.00 mm. Fits lug size 22 mm. 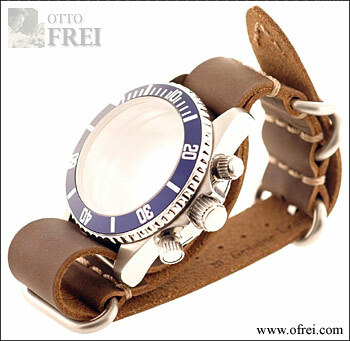 NATO style Leather watch strap with sandblasted finish metal keepers and buckle. The lug to lug "space for case" distance is 2 9/16 inches (65 mm). Total length measures 10 3/4 inches, Fits wrist sizes from 7 to 9 1/4 inches. Thickness measures 1.57 mm. Fits lug size 20 mm. 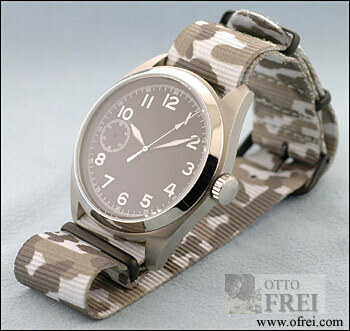 NATO-style nylon strap with 4 satin finish metal keepers and buckle. The lug to lug "space for case" distance is 1 2/8 inches (32 mm). Total length measures 11 1/2 inches. Thickness measures 1.70 mm. Fits lug size 20 mm. 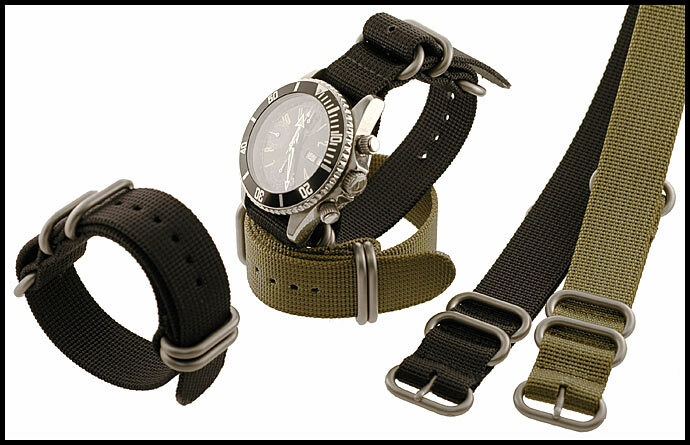 NATO-style nylon strap with 4 satin finish metal keepers and buckle. The lug to lug "space for case" distance is 1 2/8 inches (32 mm). Total length measures 12 1/2 inches. Thickness measures 1.70 mm. Fits lug size 22 mm.